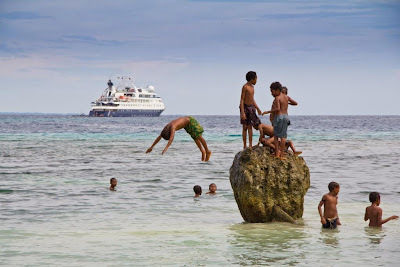 The unprecedented sales success of National Geographic Orion’s season of Melanesian voyages early in 2014 has prompted revisions to a later itinerary which now incorporates popular Melanesian highlights in Papua New Guinea, the Solomon Islands and Vanuatu, enroute to Fiji. Departing Cairns for Lautoka (Fiji), 5 November 2014, National Geographic Orion’s 13 night voyage will provide one additional opportunity to explore Melanesia onboard National Geographic Orion in 2014. Be one of just a trickle of tourists to experience remote Melanesia, far from the sushi train of mainstream cruise ships. In idyllic Louisiade Archipelago, buy pottery or exquisite wooden and stone carvings from the artisan who made the artwork; no sign here of plastic tourist trinkets being peddled. On Santa Ana, for example, children, eyes alight with glee will guide you past thatched huts and sit with you while villagers with mud covered face masks perform a stunning spear dance. Time to swim, snorkel and kayak as you explore these chains of coral atolls and scatterings of islands including Luganville. Your specialist expedition team, headed by Tim Soper, and including Chris Rainier, National Geographic Photographer considered one of the leading documentary photographers working today, will be with you to reveal remnants of fierce WWII battles - aircraft, tanks and vehicles both on land and the seabed. In this vast aquarium without glass, with all the Lindblad Expeditions tools of exploration at hand, snorkel over coral reefs the size of suburbs and dive on the famed World War II wreck, Calvin Coolidge. Kayak among the mangroves, explore along coastal trails and witness the incredible phenomenon of Fijian fire walking. All this and yet time to recharge mind and body during sea days. The joy of an afternoon siesta, comfortably relaxed on the teak steamer chairs on the spa deck, gin and tonic within lazy reach. Attend interesting and informative briefings and lectures pertinent to the region; get tips onboard and in the field from the Lindblad-National Geographic certified photo instructor about your photography techniques and equipment; view dramatic images of the undersea from the ROV (remotely operated vehicle) transmitted from 300 metres depth; be stimulated by discussions with like-minded fellow travellers, your environment and the day’s cultural and physical activities. An expedition not to be missed. Exploring the Coral Sea: Papua New Guinea to Fiji. Departing Cairns, on 5th November 2014, this 13 night voyage concludes in Lautoka, Fiji. Voyage includes CAIRNS, Kwato Island, Louisiade Archipelago, Milne Bay, Honiara, Santa Ana, Luganville, Port Vila, Lelepa, Beqa, LAUTOKA.